In the book of Acts, this new movement called Christianity went through tremendous growth and structural changes. The swelling ranks of recently pagan entrants looked to the Messianic Jews for leadership and guidance (all of the disciples were Messianic Jews) but the Jewish mentors were increasingly being spread thin. There were other external pressures too. The Jewish synagogues, which had at first accepted this strange new branch of God-Fearers, were now put off by their offspring of converted pagans who side-stepped the usual rituals. The Roman Empire too was growing impatient with the disturbances that were being caused when emissaries such as Paul and Barnabas would come to preach in the towns of Greece, Asia (Turkey), and Palestine. It was making life difficult. 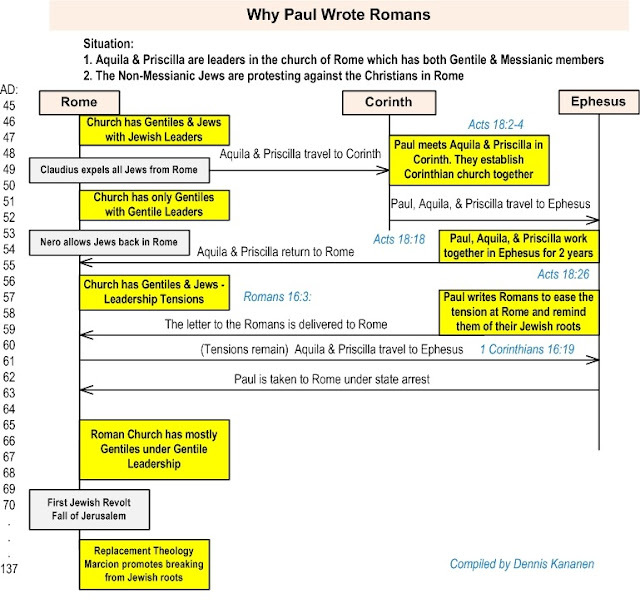 Jurgen Buhler, who is the president of ICEJ (International Christian Embassy Jerusalem) just wrote an insightful article called “Why Paul Wrote Romans” in their May 2010 newsletter. As I read the article, I immediately thought of a way to portray this using a technique that I employ in my job: creating sequence diagrams. I have to communicate how different signals in a car move from one location to another. For instance, when the driver presses a button on the steering wheel, the car sends a message to the Hands-Free Telephone, which in turn sends a message to the Navigation screen, and so on. Time descends in the vertical axis and the different locations are called out in signs with lifelines trailing below. The direction of the arrows show where the messages are going. Here are the key players, places, and events in the article shown in a sequence diagram: Work your way: top-down to follow the sequence. Follow the arrows and note what is going on in the surrounding notes and verses. Please note that the format is too big to fit in this layout. Click on the diagram to enlarge it, and then click the back arrow to get back to the post. 2 Timothy 4:19 "Greet Priscilla and Aquila, and the household of Onesiphorus." Reading these verses separately does not explain the dynamics of what is going on, and a lot is going on! Unfortunately, some of it would result in strained relationships and theological errors that would make their way down the centuries into Luther’s baggage. Rome became the first major church to become a primarily Gentile organization and it gradually distanced itself from its Jewish roots. It found its worst expression in Marcion (who was eventually repudiated), but generally degraded into entrenched Replacement Theology. Paul wrote the book of Romans to encourage the Church not to do this. This diagram is trying to show how this happened to the Roman church. Neat post, Dad. Original graphics are great! Thanks. I felt inspired to do this and the media seemed perfect for the task.